Electric service providers supply 240 volts of electricity to your home, but this does not mean the voltage remains constant. The voltage can fluctuate between 210 and 250 volts from time to time, depending on how the loads flow through the provider's power stations and switching facilities. If the lights in your home dim and brighten noticeably several times throughout the day, you need to check the current voltage coming into your home. Anything other than normal fluctuation could damage appliances and electronic devices. Check your main electrical panel for voltage fluctuation. Open the door to your main breaker panel. Locate the main breaker at the top of the panel. The number stamped on the switch represents the amperage of the breaker. Common amperages of main breakers are 100, 125, 150 and 200. Switch off the main breaker to stop the flow of electricity to the breakers and your home. Remove the screws holding the cover to the breaker panel, using an insulated screwdriver. This exposes all the wiring inside the panel and all the breakers. Take safety precautions before you test the voltage. Don safety glasses, rubber gloves and rubber-soled shoes. Stand on a rubber mat placed on the floor beneath the breaker panel. Locate the main wires feeding the breaker panel from the meter. Two wires feed the panel and connect to two silver lugs directly above the main breaker. One wire connects to the main lug of the neutral bar off to the side of the panel box. Set the dial on a multimeter electrical tester to 250 AC to test the current voltage coming into your house. Turn on the main breaker to the panel. Touch one tester probe to one of the silver lugs above the main breaker and the other tester probe to the remaining silver lug above the breaker. The multimeter tester should register a voltage between 210 and 250 volts. Contact your service provider and an electrician for any voltage reading lower or higher than normal fluctuation. 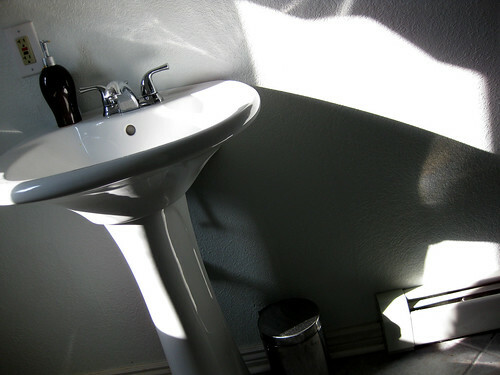 Turn off the main breaker after you finish testing and replace the cover on the breaker panel. 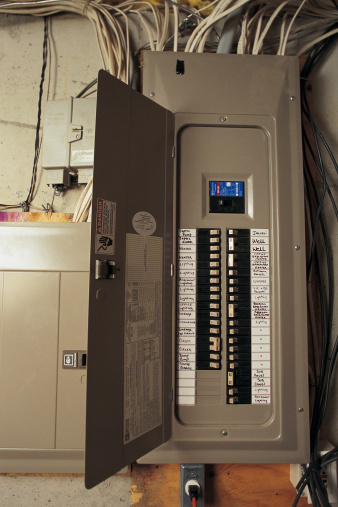 Turn on the main breaker to restore electricity to the entire panel and the house.